The much-hated Island Park Water Tower from the grounds of the Royal Ottawa in its final days (1988-89). Source: My Old Ottawa, via Lost Ottawa. 1950. 1950. 1950. 1950 was a major year for Ottawa. In addition to a rate and scale of (sub)urban growth that was entirely without precedent, the City of Ottawa had just put the finishing touches on an annexation of major swaths of Nepean and Gloucester Townships. Of the many stories that can be told about such times of rapid change and development, one of the lesser-appreciated ones concerns infrastructure and the often problematic habit we have of building outside the serviced area in our efforts to depress development costs while simultaneously being (logically) unwilling to engage in meaningful preparatory build-out. 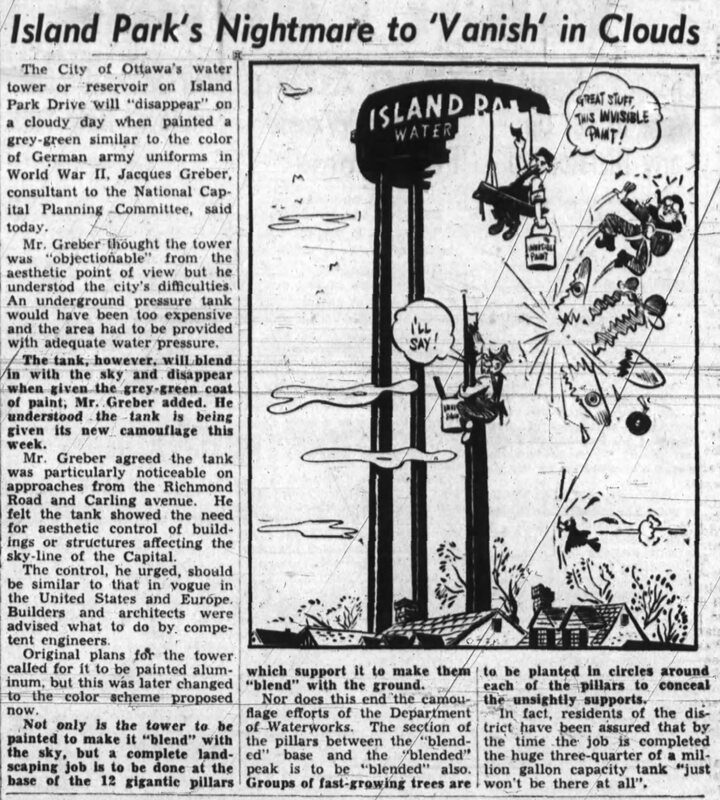 The need for – and commotion over – the Island Park (Carling Avenue) Water Tower seems as good an illustration as any. For any number of reasons, the Great Depression wasn’t as unkind to Ottawa as it was to other cities in Canada. In part thanks to the development of entirely new bureaucracies to manage the very necessary relief programs, Ottawa found itself in something of a housing shortage. While much of this was concentrated in the downtown area, areas such as Elmdale, Ottawa East, and the Civic Hospital experienced tremendous build-out during the Depression and Second World War. Had that miniature construction boom been where the story ended, Ottawa’s then aging and substandard water infrastructure would have still been unable to service the residents that it did – let alone any additional large-scale developments. Indeed, a rather large number of lots in these outlying areas were, for all intents and purposes, unserviced. Well water and septic systems in dense neighbourhoods were worrying enough for the Health Department but at least those homes had the basics. There were a worrying number of homes that were serviced, at least in theory, but turning on the taps often resulted in little more than a trickle. A rather large number of homes for sale advertised pumping systems. There was also the very problematic issue of fire services often being left with too little pressure to fight fires with. 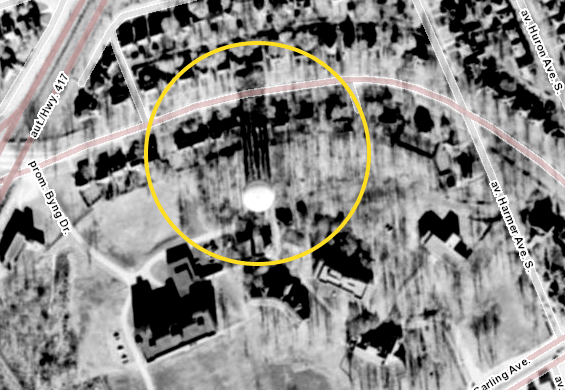 On more than one occasion in the 1930s and 1940s, pressure to the fire hydrants in these new outlying areas was far too weak and homes and businesses were lost as a result. If all of that was not enough, development outside of Ottawa’s borders had picked up considerably. Nepean Township had come to experience a similar rate of development and, much like Eastview and Gloucester, had cut a deal with Ottawa to purchase water service. 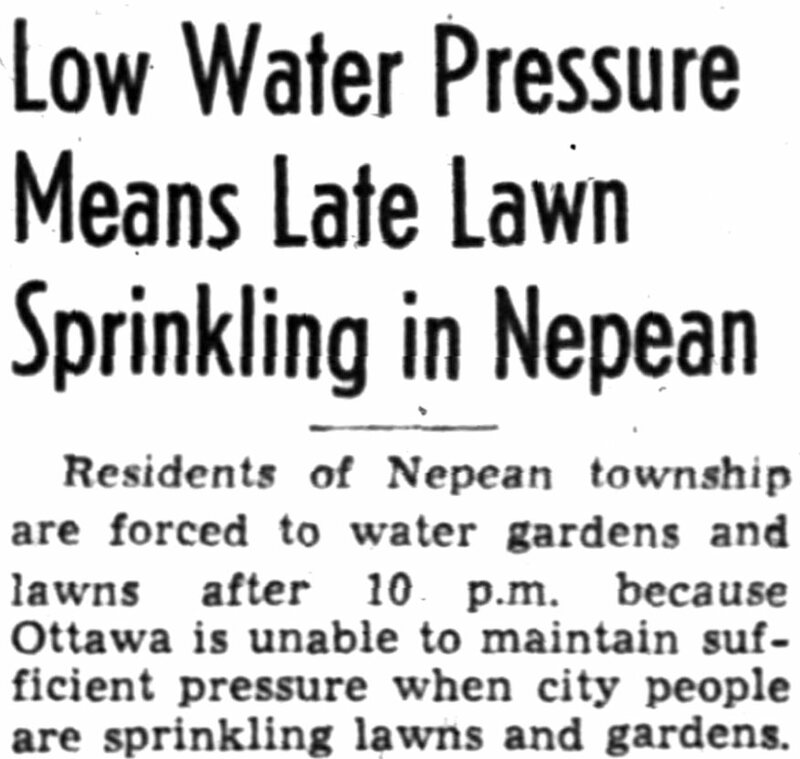 By the mid-1940s, Ottawa was having difficulties supplying residents of Nepean with water and they were placed under lawn watering restrictions. Not that they felt that they were receiving adequate service anyway. Sorry Nepean, your proud midcentury lawns will be golden rather than emerald. Source: Ottawa Journal, July 8, 1948, Page 30. 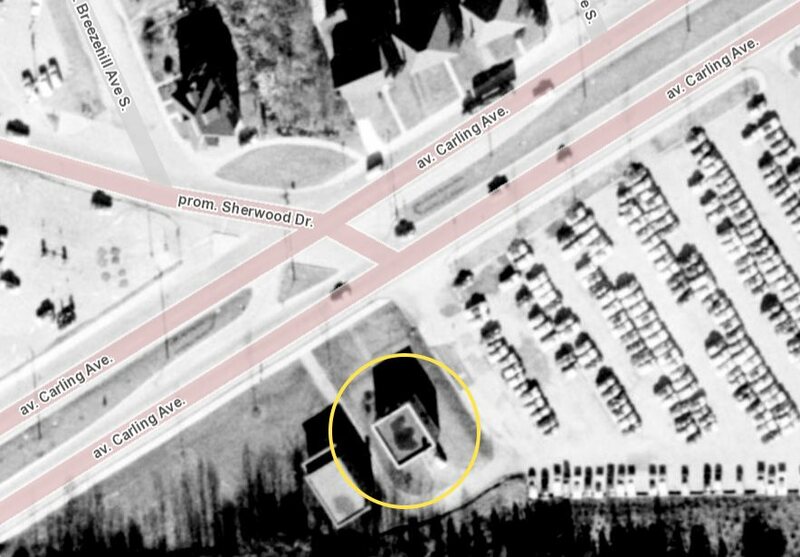 In 1948, Ottawa’s Water Works Department constructed a booster pump on Carling Avenue at the foot of Sherwood (demolished in 2003-04). Reportedly under the assumption that much of the Elmdale/Civic/Island Park area’s water pressure issue was related to its relatively elevated topographical position, it was thought that the pump would solve the problem. At least this is how it was occasionally spun in the press when reporting on local grievances. Suffice to say, while the diminutive brick pile would have been preferred by locals, it was only the first phase of a dramatic expansion of the city’s water system. City Hall watchers, who had read the Gore-Storrie Report, knew that the city’s west end was not only about to get a water tower, but also the Carlington Heights Reservoir. The little booster pump that didn’t. At least not on its own. While most area residents would have preferred that it be the only measure needed, it was only part of a much larger project to improve the water service for the whole Ottawa area. Image source: geoOttawa (1958 Aerials). 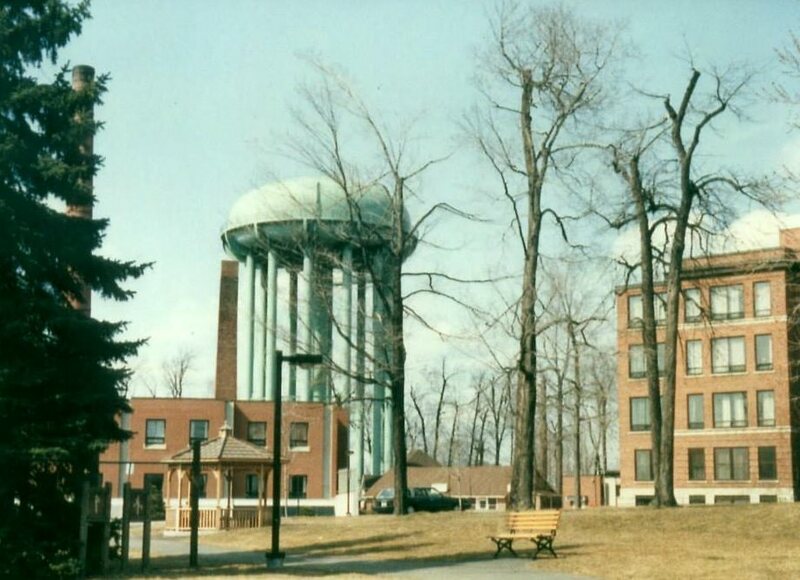 Commensurate with what was outlined in Gore-Storrie, at the end of 1948 the Water Works Department issued a call for tenders for the construction of one 750,000 gallon water tower to be located on the northern edge of the Royal Ottawa Sanatorium’s property. Problem? Meet Solution. Source: Ottawa Journal, February 24, 1950, Page 3. According to the Water Works Department’s 1949 Annual Report, only a single bid was received: from Horton Steel Works, the dominant player in water towers. 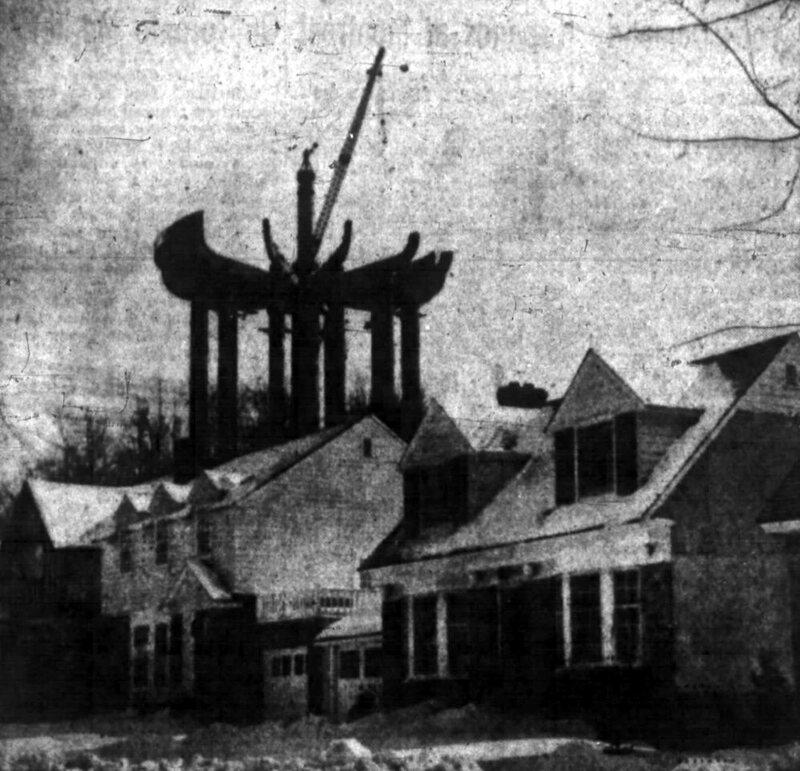 Council approved the contract on February 7, city workers prepared the site through the summer months, and Horton began to erect the tower on December 13. It was expected that the tower would be complete in April 1950. Since the start of construction of the $210,000 project last December 20, neighbourhood residents have watched, first with mild interest and then with growing curiosity as the weird structure began to take shape. Abstract curiosity gave way to alarm as it grew higher and higher, finally rearing into view over the house-tops, dominating the model homes and million dollar Federal District Commission Drive. Although widely publicized since it was first conceived in 1946, many annoyed home-owners in the area claim that it was only in the past few weeks they had discovered what the project was, believing at first that it was some kind of addition to the Royal Ottawa Sanitorium, which it adjoins. John Dalrymple, “Monstrous Skeleton Haunts Island Park,” Ottawa Journal, February 3, 1950, Page 3. One of the interesting points to the Journal’s reporting through the whole ordeal is that it was clear that the paper was very much in favour of the project as it was being implemented. The complaints of Island Park’s residents did not seem to actually curry much sympathy in the pages of the paper. For example, in the same story quoted from above, Dalrymple notes that it was mentioned in the papers no less than 14 times in 1948 when it was decided upon. Furthermore, the site was the only suitable one that fulfilled all of the engineering needs of such a project. Given that in the summer months, the Lemieux Island pumping station’s 42 million gallon pumping capability was well short of demand, it only made sense that the project had to be seen through. While Council may have been more open to residents’ criticisms, the Board of Control was not going to be moved. Source: Ottawa Journal, March 15, 1950, Page 3. As noted above, the Journal was quite vocal about the Island Park residents’ complaints. Following the Island Park residents’ loss at the Board of Control and the general quieting of the opposition, the paper published a number of articles and editorials dismissing the complaints. 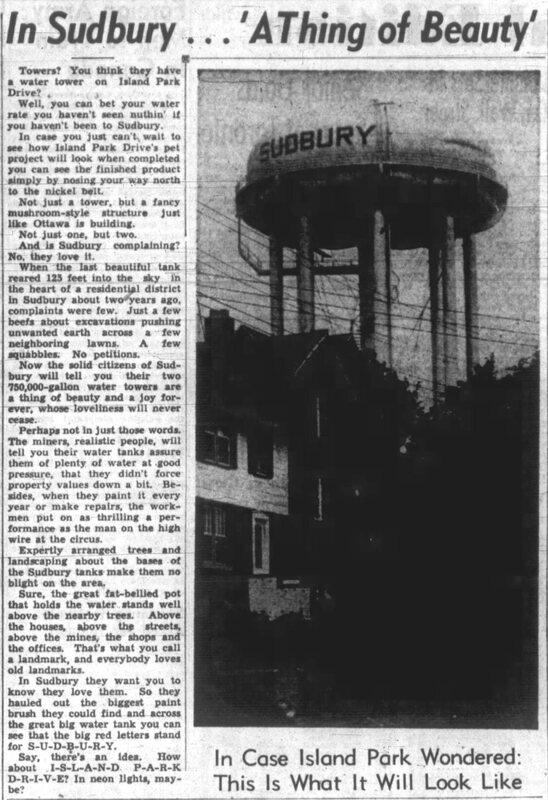 The Journal went as far as comparing the popularity of the two water towers in Sudbury to the reaction of Island Park’s residents. Source: Ottawa Journal, March 17, 1950, Page 3. While Greber didn’t find it to be an insult to his vision, he did not find it aesthetically pleasing. To this end, he assured residents that by painting it the aforementioned grey-green that it would be camouflaged. Source: Ottawa Journal, March 18, 1950. Ultimately, the grey-green (almost looks like Cambridge Blue) paint did have a sort of camouflaging effect it seems. Once it became clear that the Island Park water tower was in reality more or less as camouflaged as it could be, objections were quieted and withdrawn for the other planned towers, including the one planned for Alta-Vista. The Island Park water tower was officially put into operation on June 15, 1950 and while the Civic Hospital immediate received a much-needed increase in water pressure, the Citizen reported that when asked, surrounding residents hadn’t noticed much difference in their water pressure. While those in the immediate surrounding area didn’t notice much change in pressure, Westboro’s residents did. Once their water main was connected to the tower it was calculated that they would receive a much-needed additional 15 pounds of pressure. Much like the nearby residents, they too didn’t notice much difference. In Westboro’s case, however, it was because their water main broke under the intersection of Richmond and Churchill, losing 500,000 gallons of water in the process. A combination of frost damage and additional pressure were thought to have caused the break. 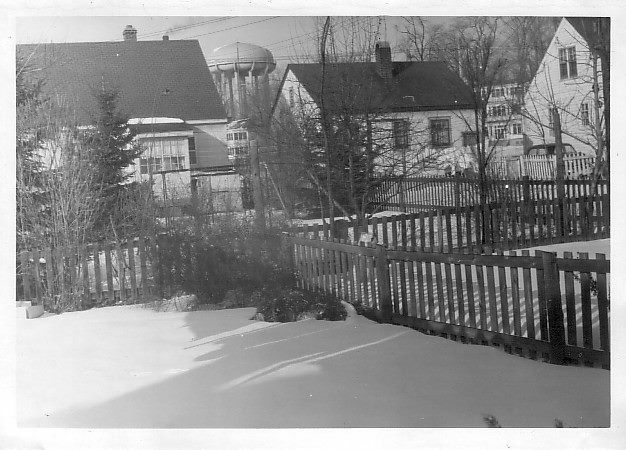 The implementation of the Gore-Storrie Report was ultimately successful and the City of Ottawa was able to fulfill the water requirements of not only its own residents in the older parts of the city, but also the newly-annexed parts of Nepean and Gloucester Townships. 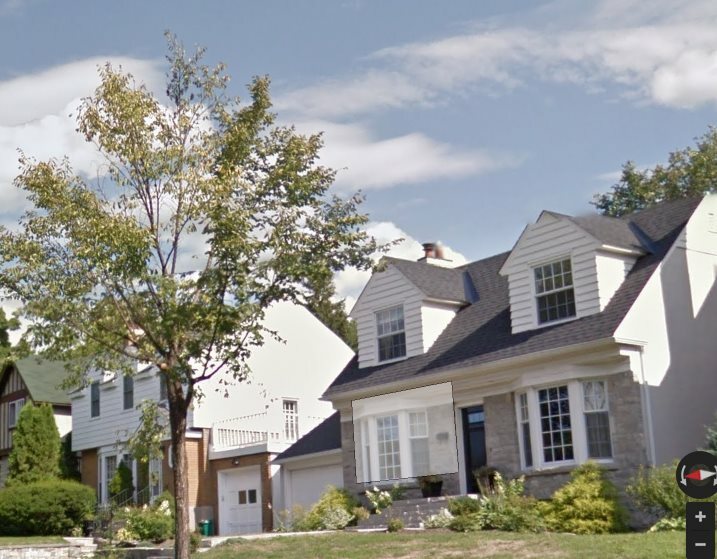 It also allowed the sprawling suburban development to continue at the clip desired and, as time went on, even the homes that were without service, received it. As the city’s water system was upgraded and modernized over the years, the water towers constructed in the 1950s became unnecessary. 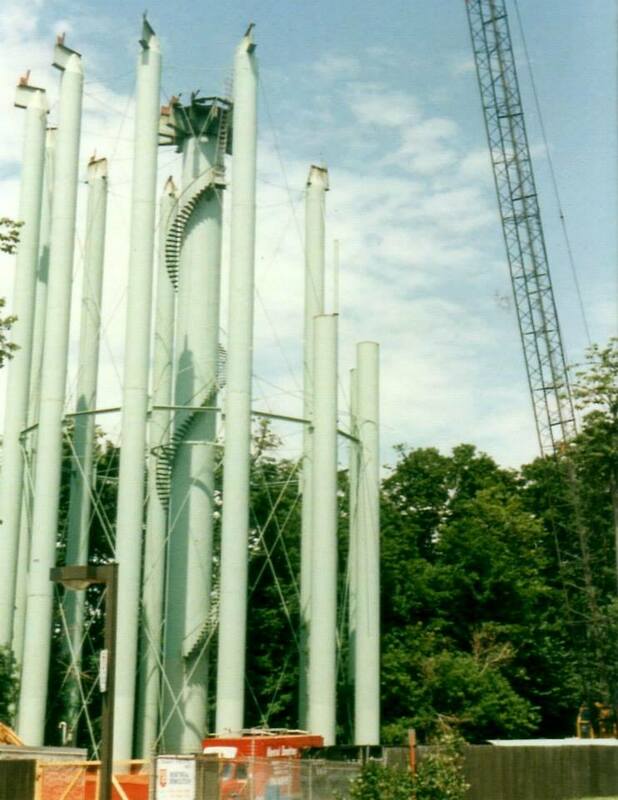 The one at Island Park was dismantled in 1989. At nearly 40 years old, its dismantling does not appear to have either been celebrated or lamented. Looking at the Lost Ottawa Facebook Group, it does appear to factor in the memories of thousands of Ottawans, however. It same down in very much the same way that it went up. Source: Lost Ottawa / My Old Ottawa. Nothing but clear skies now. There was one behind the fire station on Alta Vista Drive. That came down a few years ago too.